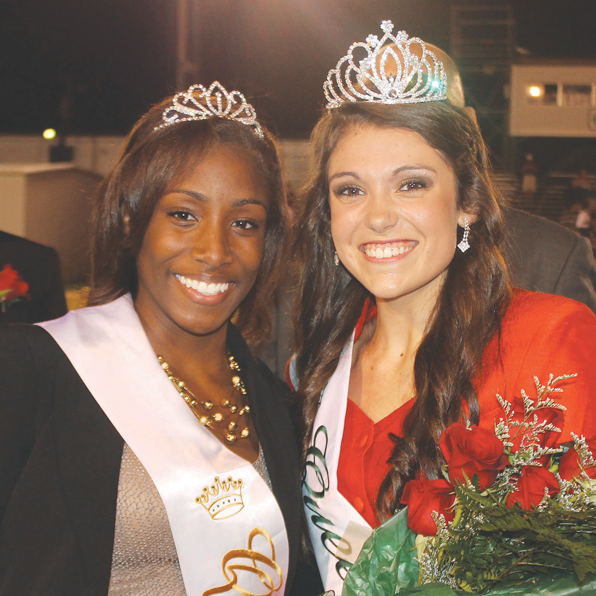 BATON ROUGE — Miss Kristen Ashford was named the 2012 Redemptorist Homecoming Queen. She was crowned by the 2011 Homecoming Queen, Krysta Boatner. Krysta is the daughter of Thomasina and Dana Boatner. She is continuing her education at Baton Rouge Community College studying liberal arts. Krysta plans to further her education at Southern A&M University, majoring in nursing. • Freshman maid Ms. Stephanie Tassin is a member of the varsity cheerleading squad, an honor student, and was voted best personality last year by the 8th grade class. • Freshman maid Ms. Rebecca Armanini is a member of the basketball, soccer, and volleyball teams. Last year she was awarded most school spirit, the president’s award for excellence, the athletic award, the Patrick F. Taylor Foundation award, and the outstanding 8th grade Catholic Youth Award. Rebecca graduated 8th grade as the BETA president. She volunteers her time with her church youth group, YELP, and is an altar server and a lector for her church parish. • Sophomore maid Ms. July Arita is a member of the RHS softball team, the football manager, and a member of Best Buddies. • Sophomore maid Ms. Jayla Anderson is a second year member of the Varsity cheer squad, and a member of several clubs on campus including, music ministry, gospel choir, BETA Club, Best Buddies, and Campus Ministry. She is an honor student with a 4.0 GPA and served as the Freshman class president. Jayla is a member of the track and field team and received the award for exceeding 50 service hours last year. She volunteers her time with the St. Isidore Youth Group and the Diocesan Youth Board. • Junior maid Ms. Kayleigh Amos is a member of the varsity soccer team, BETA Club, Best Buddies, and campus ministry. She is a member of a competitive soccer league and volunteers her time coaching 5-6 year old soccer. Kayleigh visits the nursing home weekly, and is a high honor student with a 4.0 GPA. • Junior maid Ms. Courtney Gray is a JV and Varsity volleyball player and a member of the Varsity Cheer Squad. She has been a member of the Wolfettes basketball dance for two years and is a member of the choir. Courtney volunteers her time outside of school, visiting the nursing home during the holidays. She has been volunteering in her church as a liturgical dancer since the age of three. • Junior maid Ms. Dominique Nash is a JV and varsity volleyball player and received the 2011-2012 volleyball coach’s award. She is a member of the Wolfette basketball dance. Dominique serves as the treasurer of Best Buddies and is a part of the campus ministry team and Gospel choir. She is a member of the Knights of Peter Claver Junior Daughters where she holds the position of Vice Grand Lady. Dominique has volunteered her time with the Sickle Cell Anemia Bowling bash, reading to the children in the Children’s Hospital, and Baton Rouge General. • Junior maid Ms. Lindsey Schexnayder is a member of the varsity cheer squad, peer ministry, BETA club, yearbook staff, and Best Buddies. She is a high honor student with a 4.0 GPA. • Senior maid Ms. Jandy Aguillard has been a member of the volleyball team for four years, and the soccer team for two. She is an honor student who is involved in several clubs including Best Buddies, peer ministry, campus ministry, and yearbook. To her volleyball team, thanks for the sportsmanship, leadership, understanding, and yes the bruises. • Senior maid Ms. Kristen Ashford is a member of the Wolfette Dance Team, and is the team’s captain. She has been a member of the soccer team and the track team, and has danced at Brittany’s School of Dance for 13 years. She is serving as the vice president of Best Buddies, the president of the Beta Club, a student ambassador, a member of the Hunting and Fishing Club, National Honor Society, campus and peer ministry, Student Council, and Students for Life. Outside of school Kristen enjoys dancing, hunting and fishing, and camping. She volunteers her time at vacation bible school, St. James nursing home, the Food Bank, and Holy Family’s children mass. Kristen has received a number of awards in and out of school including best in Wolfettes for the years 2011 and 2012, the 2012 Silver Timberwolf Award, Most Improved in Soccer 2012, UDA All American Award, and district governor for Beta District 7. She is a high honor student. • Senior maid Ms. Clarke Evans is a member of the RHS National Honor Society, Beta Club, Best Buddies, Gospel Choir, Campus Ministry, Peer Ministry, Student Council, and is co-editor of the yearbook staff. She is a member of the National Society of High School Scholars. She is a member of the RHS Tennis team and the United States Tennis Association. Clarke is a competitive pianist and has competed in the Heritage Piano Festival and won the DeBose National Piano Competition. Holmes is a member of the RHS varsity volleyball team and has danced on the Wolfettes basketball dance team for two years. She is involved in Campus Ministry, Best Buddies, and the Gospel Choir. She is a member of the Knights of Peter Claver Junior Daughters and St. Francis Xavier Catholic Church and currently holds the position as Grand Lady of Court 12. She received an award from Gov. Kathleen Blanco at Youth Legislature and was able to become “Governor for a Day”. She has attended a dance intensive at the New Orleans Center for the Create Arts and has danced in three productions for the FAME icon, Debbie Allen. Outside of these activities, Krystal has volunteered her time at the sickle cell anemia bowling bash, visited the elderly, and read to the children at Our Lady of the Lake Children’s Hospital.